It's that time again (although a little bit later than usual tbf! 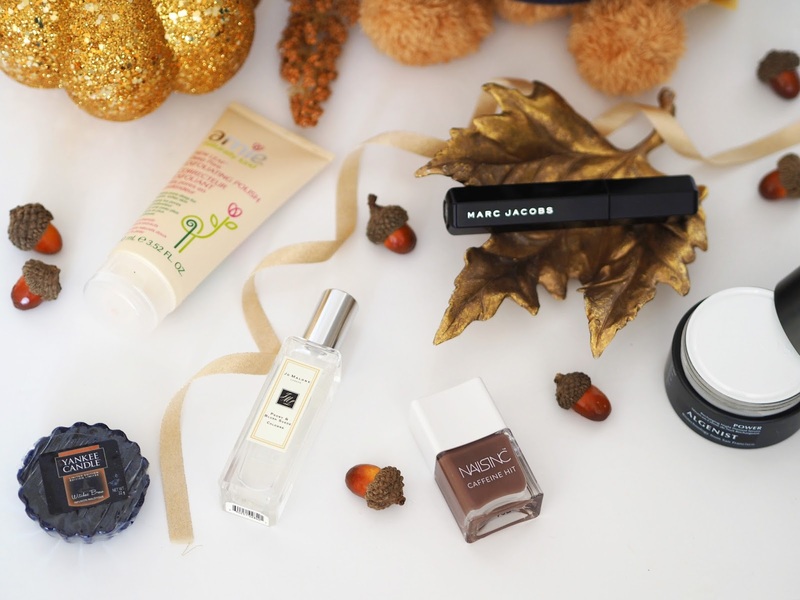 ), today I'm running you through a list of items/products that I have been loving this last month. Amie New Leaf Deep Pore Exfoliating Polish | This is the most heavenly smelling skincare product I own! I literally can't get enough of it. Amie’s New Leaf Deep Pore Exfoliating Polish contains 95% natural plant extracts, including Bamboo, Mango and Orange Blossom - which is what makes it smell so dam dreamy! The product penetrates deep into pores to lift away dirt, oil, and impurities. I find it a gentle yet still effective formula, and suitable for all skin types, especially sensitive skin as it turns quite creamy when you add water to the skin. Definitely recommended! You can buy it from Latest in Beauty or Amazon. Peony & Blush Suede Cologne | Peony & Blush Suede is quite possibly my most favourite Jo Malone fragrance of all time - it's a hard call though as the brand creates so many incredible ones! 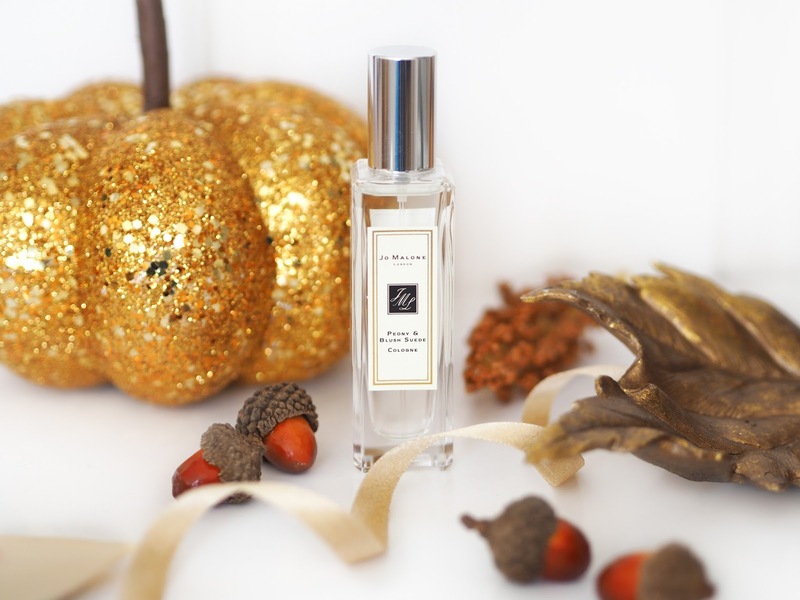 It's floral, fruity and feminine which tends to be the kind of fragrance I'm usually drawn to. I was lucky enough to be sent this by Jo Malone, along with an English Oak & Redcurrant Candle, as a thank you for organising an event (see post here) at their store in Chichester which was an absolute pleasure! I don't think I've ever been so excited to open a parcel before this one from Jo Malone, I let out a MASSIVE scream!! It was a great and totally dignified moment. "The essence of charm. Peonies in voluptuous bloom, exquisitely fragile. Flirtatious with the juicy bite of red apple and the opulence of jasmine, rose and gillyflower. Mingling with the sensuality of soft, blush suede. Luxurious and seductive.."
Top Note: Red Apple | A crisp note that captures the mouth-watering juiciness of apple, opening the fragrance with an innocent, fruity twist. Heart Note: Peony | An exquisite floral with delicate rose and honey accents and a subtle, green freshness. Fills the fragrance with the scent of peonies, just as they unfold. Base Note: Suede | A supple textural note, complementing the floral opulence of peony and bringing enticing sensuality to the fragrance. 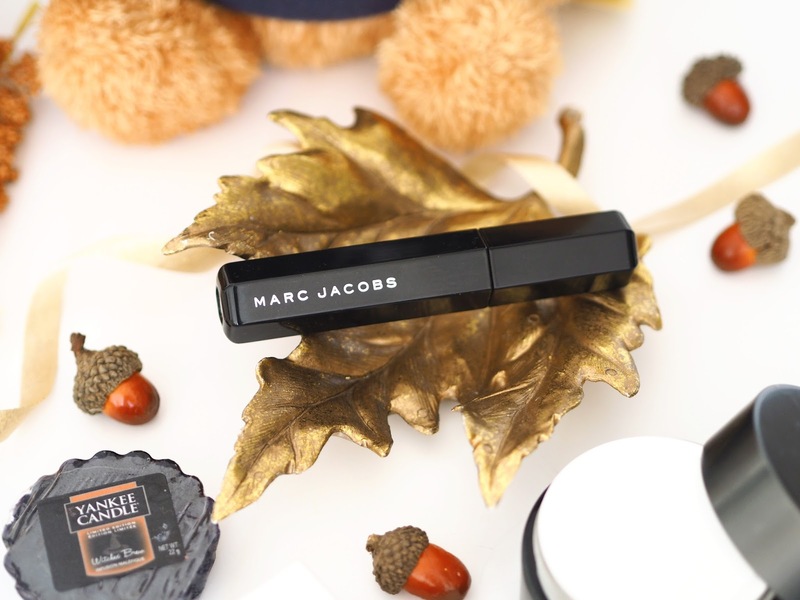 Marc Jacobs Velvet Noir Mascara | I was so excited to receive my very first Voxbox from influenster recently, these contain products for bloggers like myself to test out and feedback our honest thoughts and reviews for the brand. Mine included this new Velvet Noir Mascara by Marc Jacob Beauty, I'd never tried any of their make up before so I was intrigued to give it a go. Well this mascara has quickly become my new favourite! The wand is perfect and I'm really loving the effect on my lashes. After two coats on the top they're fluffy, long & look like false lashes. I'm also pleased to say I didn't get any smudging throughout the day! 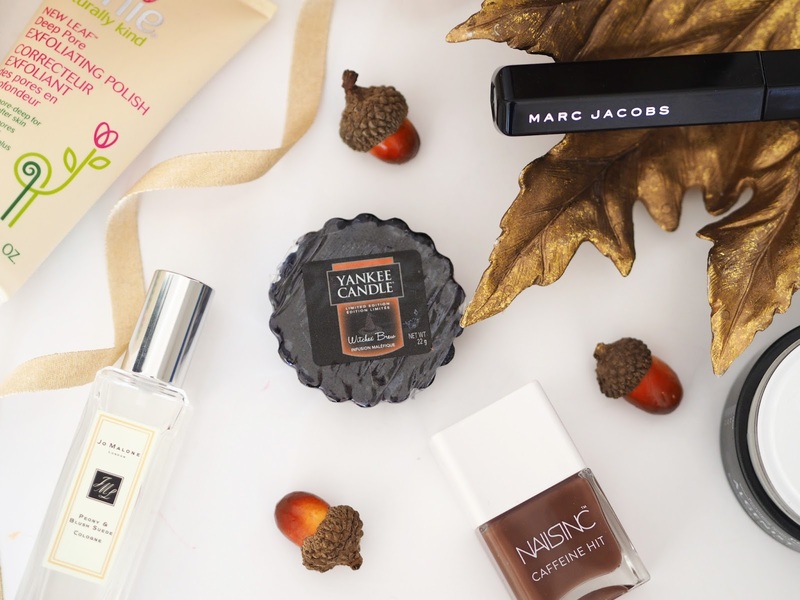 Although I wouldn't be one to say you have to pay a lot to get a good mascara, you can find some good options on the high street, this definitely has a luxurious feel to it in every respect. If you're looking to try a new high end mascara I would say it's definitely worth the price. *I received this product complimentary for review purposes but all opinions are my own. Witches Brew Yankee Candle | Witches Brew has always been my favourite fragrance to burn over Halloween ever since I discovered it about 6 years ago I think. They change the packaging every year and I now have a collection in all the different designs. Through burning this candle it made me realise how much I love the smell of Patchouli as that is one of its key fragrance notes but with an added twist of spice. This enchanting scent makes me feel like an actual potion is brewing! Perfect for Halloween time. Described as "The spicy sweet aroma of exotic patchouli casts a captivating spell!" 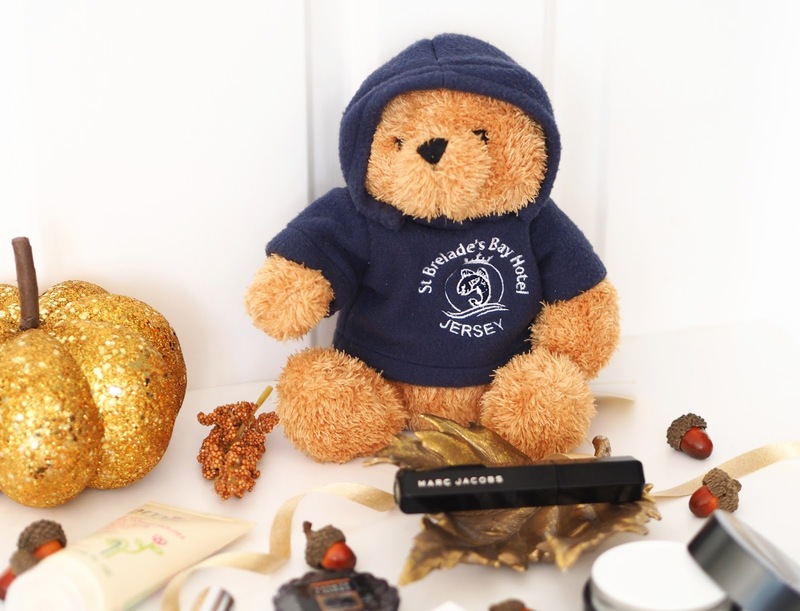 St Brelades Bay Teddy Bear | If you have been reading my blog recently you will know that I had the most wonderful holiday to the picturesque St Brelades Bay in Jersey recently - see all my blog posts here. 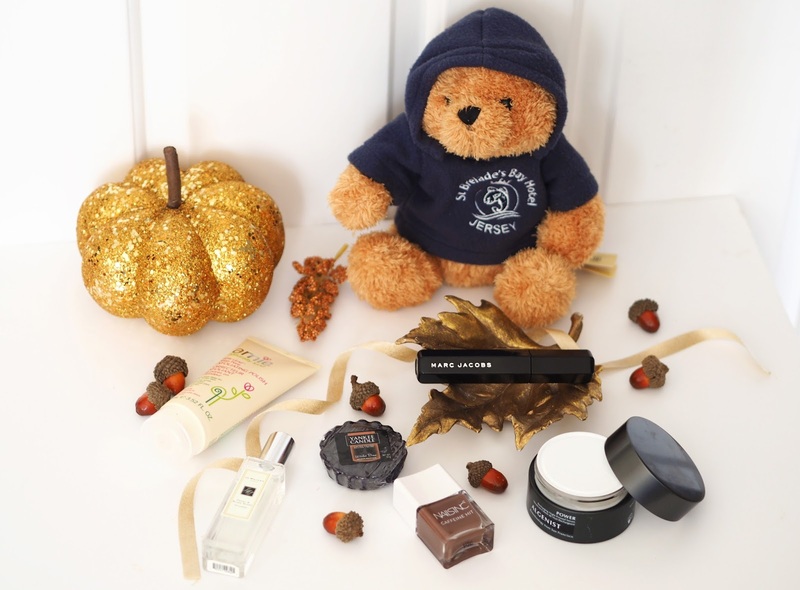 So I'm including my adorable little teddy bear keepsake in this months loves as our trip still remains in my thoughts! Nails Inc Caffeine Hit Afternoon Mocha Polish | But first coffee... 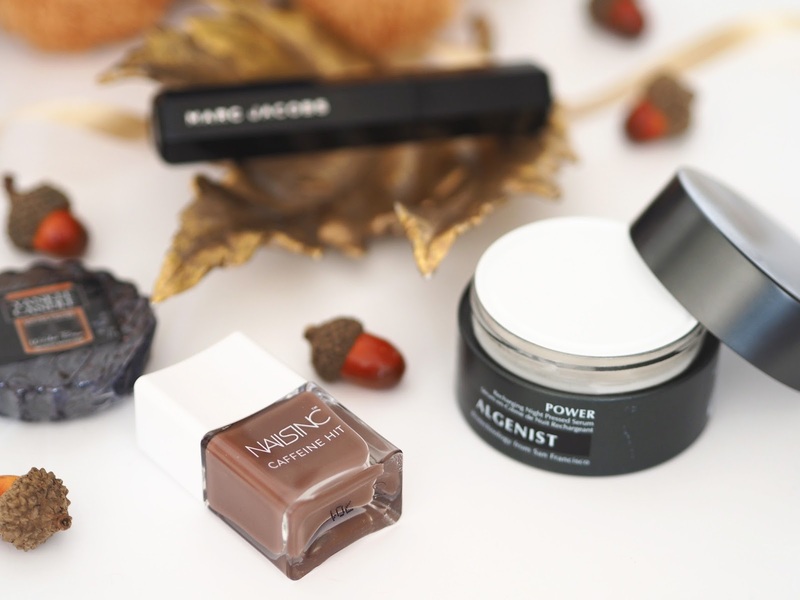 I'm loving Nails Inc's brand new collection of shades that have been released for Autumn called Caffeine Hit. They're all infused with caffeine and no word of a lie you can actually smell it once the polish has dried down - delicious!! They all have coffee inspired names such as Chai Kiss and Espresso Martini. The shade I have been loving most lately is called Afternoon mocha is the middle shade & looks so chic! Also they have brought out the most fabulous coffee scrub so be sure to check that out! Algenist POWER Recharging Night Pressed Serum | I've been trying out some luxurious skincare products by Algenist lately! The one I have been most impressed by is the Power Recharging Night Pressed Serum. This targets dullness, uneven texture & early signs of aging. It's a Balm texture & melts into a gorgeous light Serum as it warms to your skin. Not to mention it smells utterly divine of coconut water which makes it even more enjoyable to use! Let me know if you've tried anything by this brand before because I'd love some recommendations. I'm hoping to try their brand new Liquid Collagen next! Love the Nails Inc shade, so perfect for this season!